The ultimate low-profile, quick-access day bag for light carry and gear minimalists, the Everyday Sling is a redefinition of what a single-shoulder sling bag can be. As a part of the award winning Everyday bag line, The Everyday Sling features unrivaled accessibility to your gear, expandability to match your carry needs, and organization of your gear, no matter what you’re hauling. 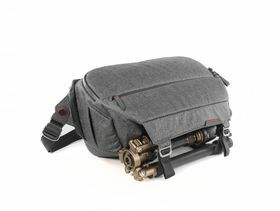 An uber-clean “no slop” design conceals a multitude of unique features, from lightning-fast strap adjusters, to a side-loading main compartment with origami-inspired FlexFold dividers, to a highly expandable outer pocket and external carry system. Plus, the sling packs flat so you can stuff it inside a larger bag when traveling. Ideal bag for beginning photographers, or pros who want to just carry their essential camera or drone gear.